Public Eye : How you can Report Traffic Violations in Bangalore? Bangalore Traffic Police has a facility wherein Public can report Traffic Violations of commuters in the city. This facility called "Public Eye" allows any citizen to report violations by uploading the photo of the violation. You can check the service at the below link. Complainant has to provide his valid credentials to make use of the service. He will also have enter the Vehicle Number, Offense, Date and Time of Offense, Place of Offense and any supporting remarks if necessary. 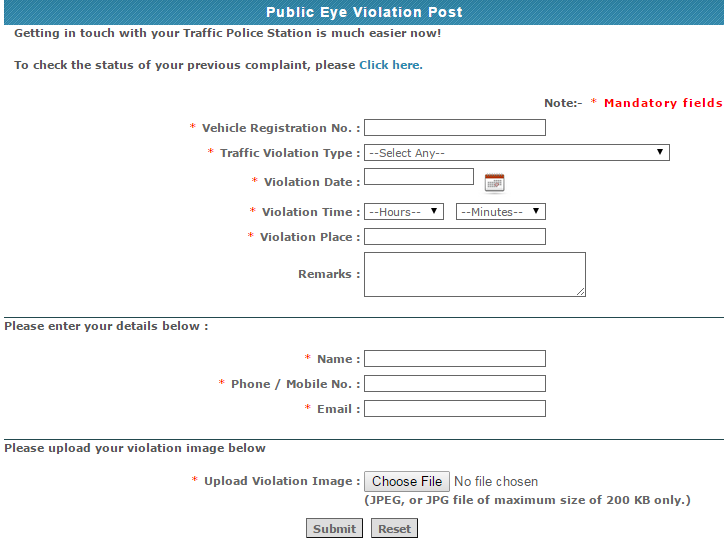 Once a photo is uploaded by a user on the portal Traffic Management Center of Bangalore Traffic Police checks the photo and credentials. If it finds the proof substantial enough then it raises a Traffic Fine against the vehicle and sends the fine notice to the violator. Public citizens uploading the photos receive a complaint number after the submitting the complaint with which they can check the status of the complaint. You can check the status of your complaint at the below link. 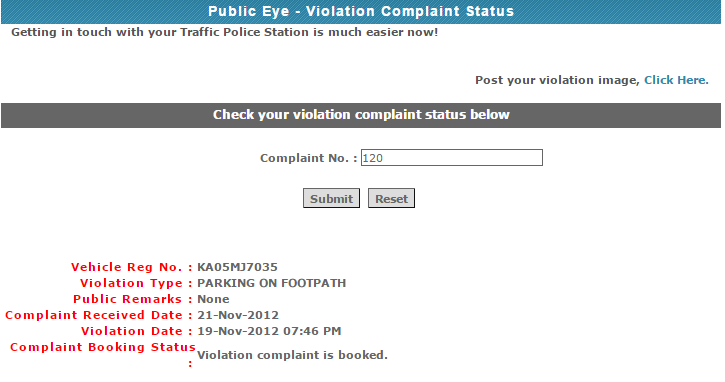 An example of a complaint accepted by Bangalore Traffic Police through the public eye portal can be checked below. Public Eye facility is also available on the Android App of Bangalore Traffic Police along with many other features such as Live Traffic Alerts, Auto Rickshaw Complaint and Women Helpline Distress Button. You can download this app from the below link.